Find Paradise at the Vista Waikoloa! 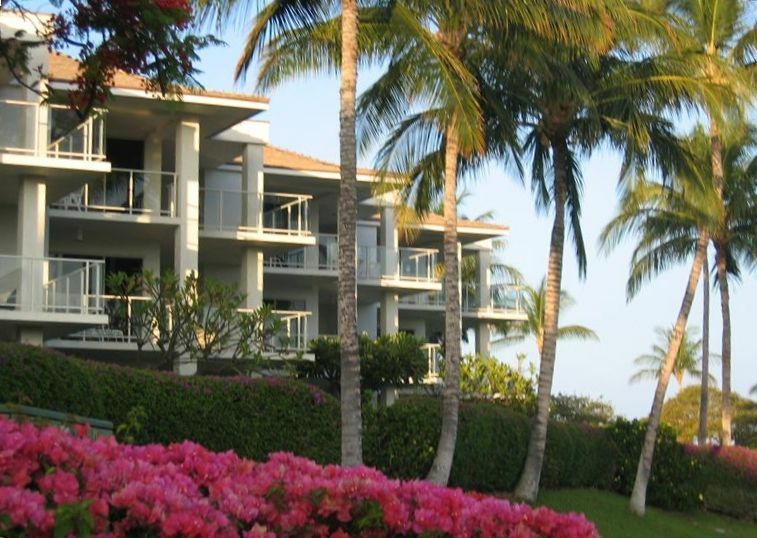 Experience the beauty and interest of the Kohala Coast on the Big Island in this recently renovated and redecorated, two bedroom Hawaiian-luxury condominium. This condo is for those discriminating guests who want “Four Seasons-like luxury” without the Four Seasons rates. Ideal for honeymoons, anniversaries and other special occasion trips, this home is specially suited for longer stays of two weeks to several months. • Large wrap-around lanai with views of the ocean as well as the adjoining Waikoloa Beach Golf Course and the Kohala Mountains—great for sunsets! The property is gated and provides the convenience of a reserved parking space for your car. The community salt water lap pool includes two whirlpools, changing rooms and space to relax surrounded by immaculately groomed grounds with an abundance of fragrant island foliage. You will also find a lovely covered community outdoor/picnic area, complete with gas grills. For your convenience, access to an onsite 24-hour fitness center and business center is also included in your rental. Within short walking distance are beaches, shops, restaurants, bars and many other amenities. Across the street you will find the Hilton Waikoloa Village with spa, shopping, 9 restaurants, and the Dolphin Quest Learning Center. Also within walking distance are: Marriott’s newly refurbished Waikoloa Beach Resort & Spa, ‘A’ Bay (a white sand beach, named one of Hawaii’s finest beaches with great snorkeling and frequent sea turtle sightings), petroglyph trails, the King’s Shops (with Roy’s, Merriman’s Café, Coach, Tiffany’s, Louis Vuitton, Macys and many others) and the new Queen’s Market Place which offers additional shopping, Starbucks, gourmet grocery and dining opportunities. For golf enthusiasts, premier golfing is practically on your doorstep. Our unit overlooks the Waikoloa Beach Resort’s Beach Course opened by Robert Trent Jones, Jr. featuring a spectacular ocean front par-five on the 502-yard 12th hole. This course is literally carved from the lava flow. You are also within walking distance of the Waikoloa Kings’ Course designed by British Open Champion Tom Weiskopf and Jay Morrish. We want to ensure that your stay at our home is an experience you will always remember. Whether you want to celebrate a special occasion, get away to simply relax and read, play golf, experience the numerous activities within the Waikoloa Beach Resort, or explore the amazing sights and activities throughout the rest of the Big Island, this elegant, comfortable condo will provide a great home during your visit. A special Welcome Gift will greet you upon your arrival! There is a Honda CRV-EX available to rent if available for $80 a day. This rate includes all taxes and fees. Fantastic stay at Vista Waikoloa! We had an excellent Christmas vacation at Vista Waikoloa. The condo was in great shape and very clean, and had everything we needed for a great stay. Definitely made use of the pool, hot tubs and grilling area. Sara was very responsive to questions. Very positive experience all the way around. This is our third stay in 3 years at the Vista Waikoloa complex. We love the location - across the street from A-Bay and walking distance to the shops. There is a lovely pool, you don't hear or see your neighbors, it's quiet, and it's good value for the area. We have stayed in a different unit each time we've been here, and this unit definitely has been the nicest furnished and has the best equipped kitchen. It has a contemporary feel without too much of the uncomfortable rattan furniture you find at so many places. It was sparkling clean and nicely updated. The patio furniture was comfortable, there were lots of towels, and I appreciated the variety of pillows to choose from. I hate limp, squishy pillows! There were two things that were less-than-perfect for me. The bed in the master is very hard. I like a firm bed, but this one was too firm for my taste. There also is some road noise since this unit is at the front of the building. We have stayed in D building in the past, and prefer the quiet of the golf course side and the lovely sunrises over Mauna Kea. The road noise isn't terrible, but since I'm a light sleeper, it did wake me up on occasion. Overall, this is a wonderful unit, and we would probably stay here again even with the road noise and firm bed! Very nice to be off the ground level to be able to feel secure and comfortable leaving the doors open at night. The breeze was wonderful. Lots of ceiling fans. Clean, well equipped kitchen. Pleasant dining on the lanai. The unit much nicer in person that is captured in the photos. Excellent location. Lovely view, but this is not an ocean view. You can see a bit of the ocean through some other properties and trees on the coast — but not well. We looked at many units in the same complex and found this cleaning fee to be higher than most for the same service. Overall we really enjoyed our time here and would definitely consider staying again. The apartment was great and was well designed and stocked. Would most definitely stay there again as it was a breeze! Another great Vista Waikoloa property. The unit is very comfortable and spacious and the kitchen is well stocked with cooking supplies. We had the BBQ pavilion to ourselves almost every night for our big group (we had 3 Vista condos at once) and had a great time. Thanks again. Fantastic Condo in Great Location on Amazing Island! We can't say enough about this unit - spacious and beautifully appointed, fully equipped kitchen, washer/dryer, wrap around lanai to watch breathtaking sunsets, close proximity to upscale shopping and a variety of dining options, great BBQ area for in home cooking, and lovely pool - a totally awesome experience. Great location to take day trips all over the island. Beautiful beaches nearby in both directions. Two weeks weren't enough to do and see all but we "saved" some for next time! Mahalo to the wonderful owners for sharing Paradise and to their property manager for great customer service. Walk to beach, Gormet grocery, Starbucks, restaurants & shopping. Nearby Petroglyph fields—the trail starts at the shopping center and goes through the golf courses, swim with the manta rays in Kona, helicopter excursions, swim with the dolphins across the street, zip-lining near Hilo, coffee & macadamia plantations, active volcano, lava tubes, deep sea fishing, whale watching, submarine excursions, star-gazing at Mauna Kea summit, orhid gardens.